Three Analog Audio Input/Output Options. Solus NX 4×4 (4 in, 4 out), Solus NX 8×8 (8 in, 8 out), Solus NX 16×8 (16 in, 8 out). All three models feature front panel display of system status and analog audio levels with the use of single push-button to navigate menus. Unlimited Programming Flexibility. Solus NX is programmed using Composer – Symetrix’ award winning open-architecture CAD application. 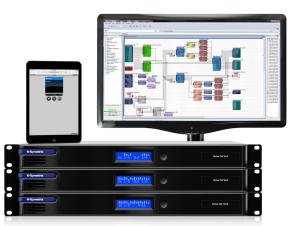 Unique to Composer is the ability to natively configure Symetrix and select third party Dante hardware – thereby eliminating the confusion of multiple or redundant software applications. Learn more about Composer here. Control Made Easy. Multiple control options include low-cost Symetrix ARC wall panels and an easy to generate SymVue Windows virtual GUI. The human readable Composer Control Protocol supports programming of third-party touch screens and control devices. An Embedded Web Server for Status and Even More Control. Solus NX’ embedded web server displays I/O levels, diagnostics data, and hosts ARC-WEB – a browser-based interface for smart phones, tablets, and computers.